Even as the temperatures began to descend from their mid afternoon extremes, the Liberty Bell competition heated up. The excitement of the evening was only starting and the crowd growing. The 23 Division 2 boys' teams toed the line with roughly 140 runners ready to leave it all on the streets surrounding Heritage High School. Making the trek down from Laramie, Chris Henry and the Plainsmen laid claim to both the individual and team titles. Threatened early on by a determined and title-thirsty Jarrett Thollot (now holding the fastest 5K time in 4A), Henry said it was his goal to take it out hard and stick with anyone around him. After winning the Division 3 race last year, Henry said he unsure of what to expect after moving up to Division 2 but realized during the race that a win was achievable and went for it. Although it wasn't Laramie's specific goal to pack run, they said they were pleasantly surprised to find their five scoring runners in the top 15, giving them a large lead with only 46 points. Finishing 3rd and 4th, Battle Mountain and Mountain View heat up the anticipation of the 4A team hunt. Ranked 1st and 2nd in the state virtual meet, this one may come down to the wire. Both teams have a relatively tight 3-5 pack, which in history we've seen prove very effective on the Norris-Penrose course. Keep your eye out for black and purple. After crossing the one mile marker together Kayla Young of Denver North, Lauren Offerman of Mountain View, and Mackenzie Marler (just a freshman) of Cheyenne East crossed the finish in the same order to claim the first three medals in the Division 2 girls' race. Knowing she is still slightly out of shape, Young said she was not entirely happy with her time but has room to improve. Considering only three Denver North girls took to the course, Young admitted she was focused on individual rather than team goals. Both Broomfield and Wheat Ridge had a nice 57-second gap between their top five runners, but the Eagles seized the win thanks to a 5th and 7th place finish by youngsters Emily Mitchem and McKenzie Gaines. Normally their third runner, Mitchem was the first of her team to cross the line with an 18:59. Her teammates were quick to acknowledge the difference Mitchem's effort made. Following the tendency of the day to pack up, all seven Broomfield girls finished in the top 50. On the day and in all races, only Wheat Ridge and Cherry Creek would post a faster overall average team time than Broomfield. 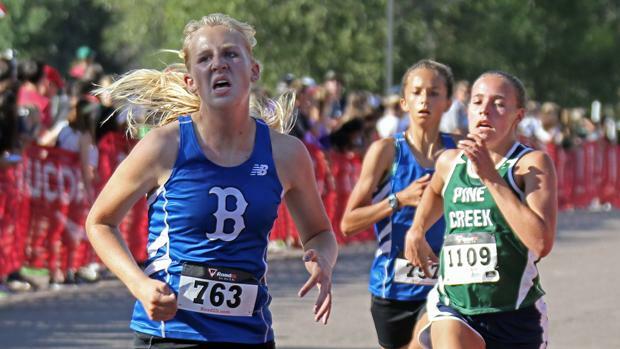 Broomfield took the win over Wheat Ridge on the basis of better placement within that 57-second pack time.